During August, the S & P 500 did decline below its 50 day SMA but is still comfortably above its 200 SMA line. S&P 500 Index Chart The S & P closed last Friday at 1,632.97, declining just 3.13% for the month. From the closing high of 1709.67 hit on 8/2/13, Historical Prices, the decline was about 4.49%. A 10% correction from that closing high number would take the S & P 500 down to about 1,538. Last Friday, my regional bank basket hit an air pocket. The SPDR S&P Regional Banking ETF fell 1.49%, much worse than the .32% fall in the S & P 500. My regional bank basket declined 1.63% led by a decline in FISI: $18.54 -0.93 (-4.78%). The 2014 consensus E.P.S. for FISI is $1.92, FISI Analyst Estimates, giving it a forward P/E of 9.65 and a 4% dividend yield at the $18.54 price. Recently, I lightened up by selling a number of bank stocks whose prices had jumped to more than 15 times estimated 2014 earnings. The respected fund manager of T. Rowe Price's Capital Appreciation fund, David Giroux, stated in a recent Morningstar interview that fair value for the 10 year treasury was 4%. I would agree with that opinion. Last week, the ten year treasury declined a tad in yield and was range bound between 2.7% to 2.8%, lower than the prior week's range between 2.8% to 2.9%. Daily Treasury Yield Curve Rates Some of the economic data, particularly on consumer spending, was positive for bonds. I suspect that the overall weakness in the stock market may also be responsible for the better bond results last week. The break-even spread for the 10 year treasury declined slightly to 2.1%. That number represents a market forecast for the average annual rate of inflation over the next ten years. The government revised its estimate for second quarter real GDP growth to 2.5% from 1.7%. News Release: Gross Domestic Product Nominal GDP rose at a 3.2% rate. I noted in my 8/10/13 post that economist Brian Wesbury was predicting an increase to 2.5%. Wesbury.PDF In the first estimate, the government estimated that the trade sector had a .8% drag on real GDP. Subsequent to that estimate, the Commerce Department reported that the June trade deficit had fallen to $34.2B in June, down from $44.1B in May. census.gov.pdf Based on the lower trade deficit number, Wesbury predicted that the drag was close to zero so he estimated that the second quarter revision would be increased to 2.5%. The justifications for the recent price declines were expressed by Jim Cramer (Video) and include valuations, the rise in interest rates and oil, and the decline in emerging market stocks and currencies. He noted that emerging market stocks have been crushed recently and "maybe the purchasing power of the people in the emerging markets are getting crushed too". I view that last remark as just silly. In his view, these stocks are viewed by investors as bond substitutes, and the recent upward spike in interest rates was causing them to lose their allure. I do not find that argument convincing. If I had a choice between buying KO or a ten year treasury, I would buy KO even if the starting yields were the same or slightly in favor of the 10 year treasury. A purchaser last Friday of a fixed coupon treasury is stuck with less than a 2.8% yield for ten years, while KO will be raising its dividend annually. Based on the prior historical rate of dividend growth, I would expect the KO dividend to double within 6 to 8 years. If I did not already have a full position in KO shares, I would be looking for an opportunity to buy shares during the current dump phase. The consensus E.P.S. estimate for 2014 is currently $2.27. A 15 multiple applied to that consensus estimate would produce a $34 price. I doubt that KO will decline that far. A 16 multiple would result in a $36.32 price per share. If there is a decline to $34 or lower, which would surprise me, I may use the KO cash dividends paid to me to fund a small odd lot purchase. I have not been reinvesting the dividend since 2010. 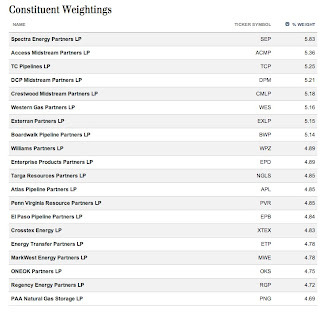 Security Description: The UBS AG E-TRACS linked to Alerian Natural Gas MLP Index (MLPG) is an ETN that tracks a natural gas infrastructure MLP index. An ETN is an unsecured senior note. The issuer of MLPG is UBS, so an owner of MLPG is subject to the credit risk of UBS just like any other owner of a UBS issued senior unsecured note. Distributions will be variable and are paid quarterly. 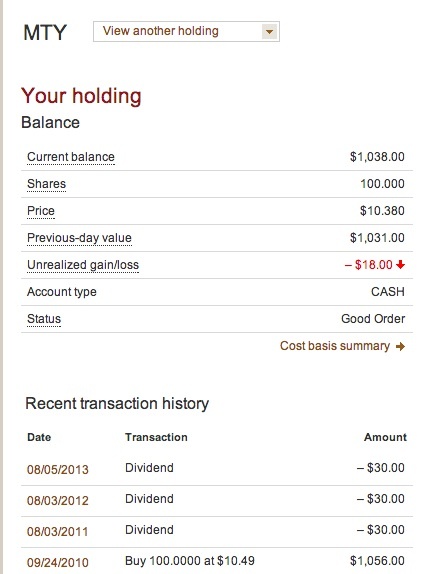 The last dividend was $.4407 per share and went ex dividend on 7/11/13. Based on the last four distributions, totaling $1.7495 per share, the dividend yield would be about 4.98% at a total cost of $35.15 per share. The total distribution was $1.7342 in 2012 and $1.5022 in 2011 (click Distribution Tab at sponsor's webpage for MLPG). The annual tracking fee is .85%. 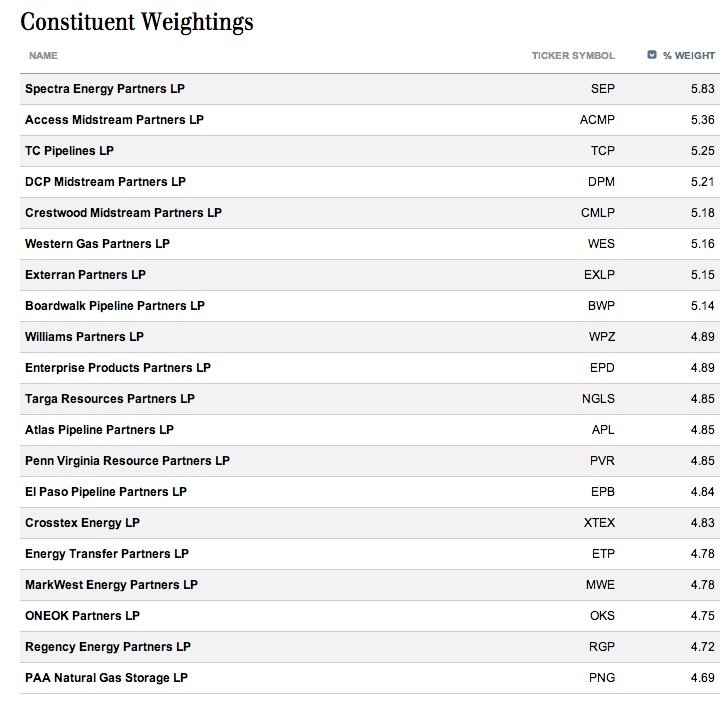 This ETN owns MLPs that transport, store and process natural gas and natural gas liquids. According to the sponsor, the total return for MLPG between 8/22/12 to 8/22/13 was 25.28%. 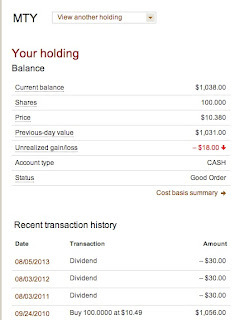 Prior Trades: I previously bought 50 shares at a lower price: Item # 4 Bought 50 MLPG at $31.26-ROTH IRA (February 2013) I did not want to own more shares in an retirement account, so I bought this lot in a taxable account. I have copied and edited some of my prior discussion about the natural gas super cycle. The article in a UK trade journal intrigued the LB so it proceeded to read it: "GE bets on 25-year gas super-cycle": Gas to Power Journal UK The main guy at GE Power was predicting a 25 year natural gas super cycle. LB is always interested in super cycles, such as the one recently discussed in connection with the parabolic rise of middle class consumers in emerging markets or the super cycle that led to the long term bull market starting in 1982. The next article read had the following title and was even more intriguing: "Gas-fired CCPPs will dominate US power market": Gas to Power Journal UK In that article, a Siemens V-P stated that the competitive advantage of large coal fired plants was being eroded by the economics of low cost gas generation. Back in the day when LB knew something about energy production from natural gas turbines, approximately 30 years ago, gas fired turbines were used by electric utilities over short term cycles to meet peak demand (e.g. the hottest part of a summer day). When that demand fell off, they would be turned off. The power cost from those units was high cost. Power produced by large coal and nuclear units was much cheaper, due to economies of scale, and those units were used to provide what is known as the base load requirements. Base Load and Peaking Power; SmartPlanet Those units would be running 24/7 except when shutdown for periodic maintenance. The guy from Siemens was saying that the cost advantage of coal generation was eroding in favor of the natural gas fired units. Coal units are only used to meet base load. So will the natural gas fired units be the new base load, running 24/7, burning up all of that natural gas to produce energy instead of coal? It just appears to me that there may be no other choice. Nuclear plants take an incredibly long time to build, and utilities are not exactly beating down the door to build new ones in the U.S. Yet, the Obama administration has clearly embarked on an environmental policy to shut down a significant number of coal generating stations by making it uneconomical to retrofit those plants with pollution devices to meet new clean air standards promulgated by the EPA. I am not going to repeat my discussion about those EPA rules, contained in the comment section of this SeekingAlpha article: Seeking Alpha The author of that article was recommending an Illinois Basin coal producer, so I took issue with that recommendation based on what was happening with the EPA. In my capacity as an investor, it is irrelevant whether I agree or disagree with the EPA policy. The relevant consideration starts with a very simple question that trial lawyers always want to know: "what are the facts". Once an investor has a grip on the relevant facts, the issue then is simply how to respond. Knowing about the direction and potential impacts of EPA's emissions rules, which have already resulted in plant shutdowns, I would not be in the market for a coal stock. The product is in abundance and the demand is about to fall. A recent article in the WSJ noted that more crude oil is being transported by barge, train and truck in the U.S. than at anytime since the government started to keep records. (2) Total Return Potential: Hopefully, the cash distributions will trend up over time and the existing distribution rate is desirable in a a low yield world. (3) The ETN Structure Eliminates the K-1 Hassle: As noted in the sponsor's fact sheet, the distributions are reported as ordinary income in a 1099 and the owner of this security will not receive a K-1 form. This is a major selling point for me since I hate fooling with K-1s at tax time. Risks: (1) UBS Credit Risk: An ETN is a senior unsecured note. As such, the owner of MLPG is subject to the credit risk of UBS. If UBS goes bankrupt the owner of this security will be in the same position as all other owners of the issuer's unsecured senior debt. While the amount of recovery in such an eventuality is unknowable, I generally would anticipate around 15 to 25 cents on the dollar after a prolonged period in bankruptcy where nothing would be paid to the owners of the issuer's debt. (2) Concentration and Market Risk. Snapshot of Profit: PCBK was initially purchased as part of the lottery ticket basket strategy and later elevated to the regional bank basket strategy based on reported earnings. I will credit the entire gain to the regional bank basket. Rationale: The primary motivation was profit taking. I also did not like what I read about a recently filed lawsuit. Pacific Continental Bank announced last Friday that it had been named in a lawsuit brought by individuals who had "placed" money in Berjac of Oregon and Berjac of Portland, both of whom are now in bankruptcy. I had never heard of those entities, so I did some digging. I reviewed the allegations in the Complaint: Berjac Class Action Complaint.pdf The plaintiffs allege that they were victims of "Ponzi scheme" that was "conducted by defendant Fred "Jack" Holcomb, Michael S. Holcomb, Gary L. Holcomb, Berjac of Oregon, an Oregon general partnership, and Berjac of Portland, an Oregon general partnership". The two sons were not named as defendants since they are in bankruptcy. Without going into detail, the gist of the allegation is that the Berjac entities were engaged in insurance premium financing. Berjac would pay the annual insurance premiums for a business who would pay Berjac back monthly after making a 25% down payment. To finance its operation, money was raised from investors by promising returns of 6% or more and allowing for frequent withdrawals. I never will understand why individuals line up to throw money at such offers. At some point, the Berjac entities started to use the money to speculate in real estate and many of those investments did not prosper, a typical LB understatement and attempt at humor. After reading most of the Complaint, and taking some allegations with the usual and appropriate level of skepticism, the case did not not appear to be very strong against the two banks named in the lawsuit, Pacific Continental and Umpqua Holdings Corporation (UMPQ). A detailed discussion of Berjac's history can be found at OregonLive.com As reflected in that article, the two sons, at a minimum, lacked sufficient business acumen and competence to run Berjac. Sloppy is just one of many unfavorable words that describes their management. Still, there is enough stink alleged in that complaint to cause me to sell my 100 shares PCBK shares. Future Buys: I am not likely to even consider buying this stock again until the foregoing litigation is resolved and the shares present are reasonably priced based on then existing earnings. 3. Added 50 BTZ at $12.35 (see Disclaimer): After skipping two weeks, I elected to nibble at a bond CEF last week. Security Description: BlackRock Credit Allocation Income Trust (BTZ) is a leveraged closed end bond fund. BTZ closed last Friday, 8/30, at a -14.91% discount to its $14.62 net asset value per share. The current monthly dividend rate is $.0785 per share. Assuming that rate is continued, which is in no way assured, the dividend yield at a total cost of $12.35 per share would be about 7.63%. The fund sponsor states that the "option adjusted" duration was 6.88 years as of 6/28/13, with leverage at 32.5%. (under portfolio tab at sponsor's website). 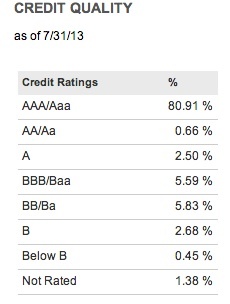 The credit quality as of 6/28/13 was 46.4% in BBB; 14.6% in A and 3.2% in AA or AAA, with 18.2% in BB and 13.5% in B. Generally speaking, an investor can multiply the duration number by the percentage increase in interest rates to arrive at a ballpark potential loss number. A 1% rise in rates for a fund with a 7 year duration could result in an approximate 7% loss, Get to know your bond fund: Duration| Vanguard. Prior Trades: After initially trading this bond CEF profitably, I reentered at an inopportune time and consequently been averaging down. I am reinvesting the dividend. I am now back up to 347+ shares in a taxable account, with a $13.12 average cost per share, and another 304+ shares held in the Roth IRA. With the recent price decline, I have started to reinvest the dividend paid by all of those shares. Some of the following discussion is copied from prior posts on BTZ. Rationale: The discount to net asset value has just become excessive for this bond CEF. I am reinvesting the dividend to buy more shares and have started to do so only recently after a long hiatus for the position held in the taxable account. The ROTH IRA positions are new. For the next two years, and probably longer, I am not going to earn anything by keeping money in a money market account. My main taxable account now has about 25% in cash earning nothing. Before taxes and inflation, this bond CEF would have to go down about 7.63% to wipe out the income generation over the next year. Even if the decline happens, I would be even before taxes and inflation, compared to the income generation in a money market account. I am trying to balance the desire for some income with the potential principal losses inherent in buying bond funds now. I have for now arrived at a balance where I will invest up to $1,000 per week in a bond CEF and reinvest monthly dividend distributions to acquire more shares. I am also skipping a few weeks. That balance was struck after considering the following items. (1) The declines in market prices for bond CEFs are substantially higher than the declines in net asset values per share, and the discounts now exceed the averages for 1, 3 and 5 years. As the price falls more than the net asset value, I increase my current yield with new purchases, and the yields are attractive in the current abnormally low interest rate environment. BTZ is weighted, moreover, in BBB or higher rated bonds. (2) Inflation expectations over the next 10 years remain low and would cap bond losses due to interest rate normalization provided that expectations remains close to 2% per year. (3) Short term borrowing costs are likely to remain low for several more years for two reasons. The FED is likely to continue ZIRP into 2015, which will anchor short term rates near zero, and will likely raise its federal funds rate much slower than in previous tightening cycles. So, the cost side of the interest rate spread is likely to remain favorable for leveraged bond CEFs for the next 2-3 years and possibly longer. I would add the usual caveat. I would not want to own a leveraged bond fund when both short term and long term rates are rising, particularly when the later increases are due to accelerating inflation and inflation expectations. The market will front run the FED, as shown by the recent spike in intermediate and long term interest rates, as inflation expectations have declined some, in anticipation of tapering and the eventual end of QE. Risks: (1) CEF Prices are Determined by Frequently Irrational Investors: This is risk applicable to all CEFs. Irrationality can result in a CEF selling at a significant premium to net asset value or at an increasing discount even when the net asset value per share is going up. (2) Rise in Interest Rates: When interest rates start to rise, the leveraged bond CEF would be one of the worst investments to own. The fund's borrowing cost would be going up at a time when the bonds are going down in value. Most likely, the discount to net asset value would be widening in that scenario-The Infamous Triple Whammy! The process of interest rate normalization will be difficult as I have noted many times previously. Stocks, Bonds & Politics: The Difficult Path to Interest Rate Normalization As long as bond prices are moving down and yields up, investors will continue to flee bond funds and bond CEFs in particular, placing additional downward pressure on pricing of bond CEFs that is likely to exceed the percentage decline in net asset value. That pricing action is a known risk for CEFs since the pricing is not dependent on the closing net asset value, which is the case for a bond mutual fund, but on the supply and demand factors characteristic of a common stock, with no mechanism available to bring price back into line with net asset value per share which exists for bond ETFs. The foregoing presents a risk but also an opportunity to acquire assets at discounts to net asset value per share, which increases the investor's yield compared to a bond mutual fund selling at net asset value, and the yield increases as the discount expands, just like buying a bond at a discount to its par value. The problem is that the discount can continue to widen after purchase which is then made worse by a concomitant diminution in net asset value per share. Leverage aids to the losses as the assets bought with borrowed money decline in price. Leverage adds potential risks and benefits. The benefits are a higher yield due to the spread between the short term borrowing cost and the higher yield paid by the bonds purchased with those borrowed funds and more of a net asset per share gain when the assets purchased with borrowed funds are increasing in value which has not been the case recently of course. The interest rate risk exists but is mitigate to some degree by the duration. Credit risk always exists for this fund, but is not as pronounced as a pure junk bond fund given the weighting in investment grade securities. Future Buys-Sells: I may continue to add small lots provided the discount to net asset value continues to expand. It just seems to me that the widening in the discount over normal levels already reflects a 6% to 8% further decline in net asset value per share based on another 1% or so rise in interest rates. Security Description: The Guggenheim Canadian Energy Income ETF (ENY) is an ETF that owns Canadian energy and pipeline stocks. This ETF has performed poorly for reasons that are not entirely clear. I will discuss some possible reasons below. I have also traded Husky profitably in the past. 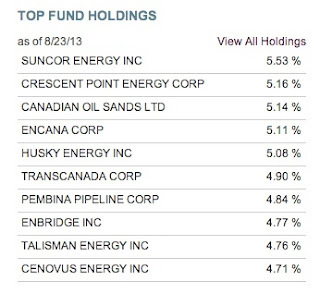 Prior Trades: While I have traded individual Canadian energy companies profitably, and currently have unrealized gains in Suncor and Husky Energy, I am sitting on an unrealized loss in ENY shares, so I decided to average down. 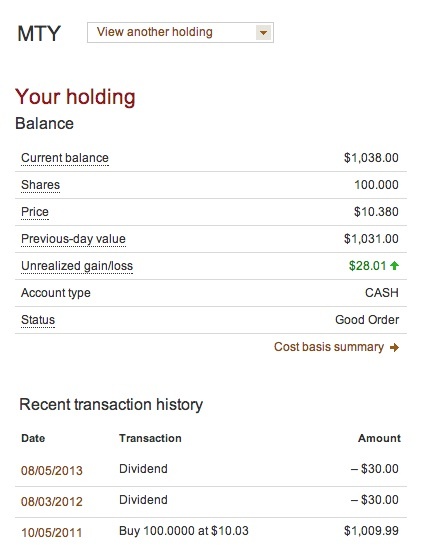 I am also reinvesting the dividend to buy additional shares, another method for averaging down. So, before digging myself into a small hole, I had realized a total gain trading this ETF of $366.69. Rationale: Canada is not Venezuela, Argentina, Russia or the Middle East. The current price is attractive in my opinion for a long term hold, as the Canadian energy companies are likely to prove their value in the years to come. Canada may at times take some action that adversely impacts profitability, but nationalization is most likely never to be on the agenda. Christine Kirchner, the President of Argentina, nationalized a 51% interest in YPF to the dismay of Repsol, Seeking Alpha, a pattern that has been followed throughout the developing world for decades. 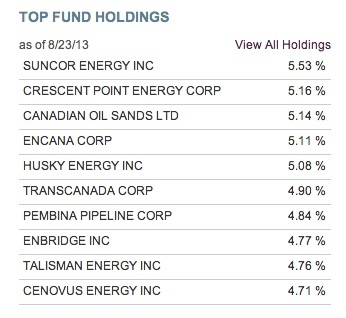 This ETF has recently added some Canadian pipelines that will generate more income. I do not pretend to know where oil prices will be the coming years. With increasing demand from a hoped for cycle of worldwide economic growth, and dramatically increasing oil consumption in developing markets, particularly in China, one outcome in the coming decade would be a substantial surge in oil's price from existing levels. I try not to over think possible future outcomes. This seems like a realistic possible outcome which is sufficient for me to put some cash into this theme. The Canadian oil sands do contain a long life crude oil asset The government of Alberta estimates that there is about 173 billion barrels of oil that can be extracted from the oil sands located in that province using current technology and based on prevailing oil prices. There have been a number of recent acquisitions of Canadian companies exposed to oil sand production, including the recently approved purchase of Nexen by CNOOC. CBC News The Canadian government may not be receptive to more acquisition by oil companies controlled by foreign governments. In previous discussions about Canadian energy companies, I referenced an interview with Charles Maxwell published in 2011 by Barrons who was then predicting $300 oil by 2020 and recommended two Canadian energy companies, Suncor and Cenovus, with heavy exposure to the oil sands. While $300 oil by 2020 is a stretch, I would view it as more likely than not by 2025-2030. Risks: I would describe the risks as normal ones for a sector stock ETF that invests in foreign companies. The foreign company angle adds currency and country risk. When I think about country risk, the first image that pops into my mind is Hugo Chavez. Needless to say, Canada is not likely to follow Hugo's example, but there is always the possibility that the federal or provincial countries will enact laws (particularly increased taxes) and regulations adversely impacting the profitability of its energy companies or the acquisition of those companies at premium prices by foreign entities. The expense ratio is high at .79% and .7% after a fee waiver. 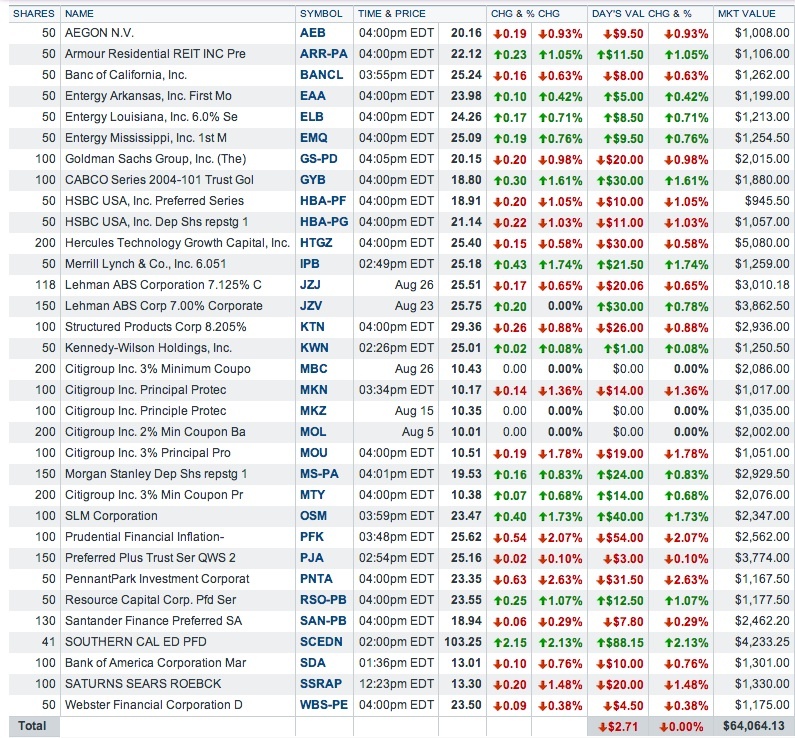 Future Buys/Sells: I may buy another 50 shares at below $13.5. Rationale: My ownership of this security revealed a personality flaw as an investor. My broker, Fidelity, would periodically lose the pricing of this security for extended periods and then manage to find the price, known to everyone else, for a brief period. Sometimes, another Canadian ETF, CLF:CA, would become invisible to Fidelity's computers, and I own 700 shares of that one. When the pricing of both disappeared from my account value, the impact could be around $17,000. Maybe I am just getting old and a bit ornery. I do like to know my true account value. Recently, the price of both CLF:CA and XFR:CA disappeared for a couple of weeks, and then Fidelity found CLF's price while continuing to be unable to locate the price of XFR. I reached a maximum level of annoyance and consequently sold XFR. 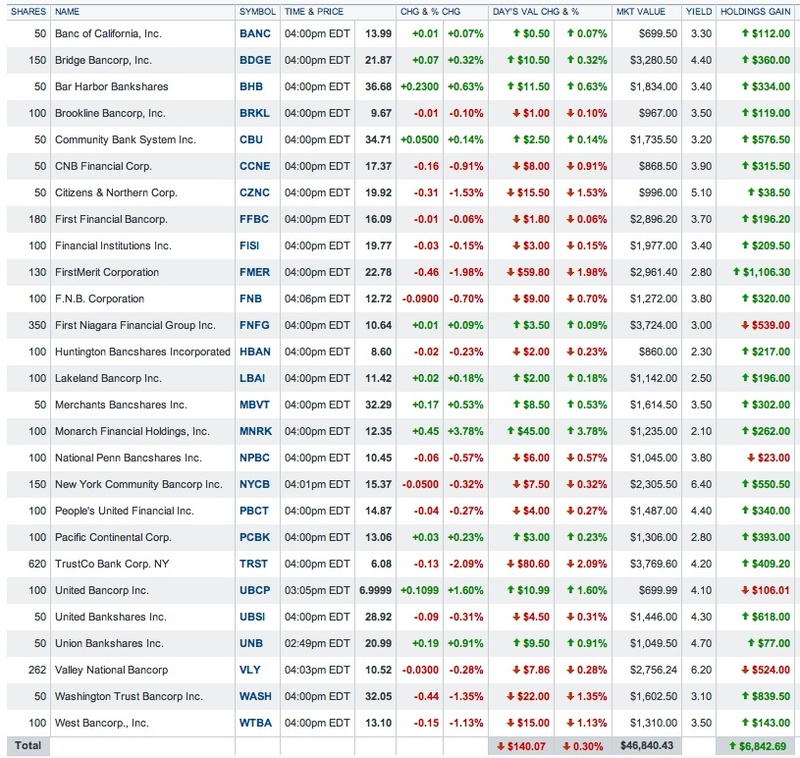 Here are the prices that anyone can find at a financial website, or the Toronto exchange, Stock Market Quotes. XFR is not paying much of a dividend now, which is another reason for selling it in order to reduce my annoyance level with Fidelity's inability to find its market price. The fund is able to pick up some yield by investing in high yield and investment grade corporate bonds plus a small weighting in foreign sovereign bonds (2.2% as of 12/31/12). The fund had a small weighting (5.2%) in treasury inflation protected bonds issued by Canada and the U.K.
SEC Form N-Q (holdings as of 3/31/13)(shows reduction in non-U.S. TIPs to 2.3% and sovereign bonds to 2.1%. The sponsor lists the duration as 8.01 years as of 7/31/13. The fund is currently unleveraged. I would view the absence of leverage to be prudent given the low TIP yields, the trend toward higher nominal rates due to interest rate normalization, and the relatively benign inflation numbers. The fund is paying a monthly dividend of $.0335 per share. At a total cost of $11.44 per share, the yield would be about 3.51%. At least that yield is better than the .01% paid by the money market fund used to fund this purchase. On the day prior to my purchase, WIW closed at a -14.58% discount to its net asset value per share. WIW closed last Friday, 8/30, at a -14.7% discount to a net asset value per share of $13.47. I have also traded the functionally equivalent IMF. I am glad that I have not bought either WIW or IMF back until I made the 300 WIW share purchase last Tuesday. Rationale: With the tensions rising in the mideast, investors may move toward the risk off direction which could easily cause a significant, though temporary bounce, in high quality bonds. WIW is selling an attractive discount. Recently, however, due to a spike in interest rates unconnected to a rise in CPI, TIPs have been positively correlated to other bond classes to the downside, as nominal treasuries and other bond classes reset toward market based rates uninfluenced by massive FED buying. Risks: A treasury inflation protected security will not protect an investor from a rise in rates due to interest rate normalization rather than to an increase in inflation and inflation expectations. As the comparable maturity non-inflation protected securities started to decline in price and rise in yield, the TIPs did the same. Since May, the modest rise in inflation was nowhere near enough to offset the rise in rates. On 4/30/13, WIW closed at $13.33. WIW Interactive Chart Unadjusted for subsequent dividend payments, the price declined 14.18% until I purchased shares at $11.44 on 8/27. Intermediate and long term nominal rates started to rise on 5/2. The five and ten year TIPs were in negative current yield territory in early May. By 8/26/13, the 10 year TIP current yield had risen to +.64%. Importantly, CPI has remained tame during that yield rise. In order to go from a negative .62% to a positive .64%, vintage TIPs would have to decline significantly in price in order to cause that swing. The TIP ETF has also declined in price over this time period: TIP Historical Prices TIP closed at $121.68 on 5/2/13 and at $110.96 on 8/26/13. When I sold my individual 10 year TIPs last May, the purchaser acquired bonds that had a negative yield of -.89%: Item # 1 Sold 3 TIP Bonds Maturing in 2019 at $120.45 I calculated at the time that my profit of $838.87 (see snapshot) would likely exceed the interest payments and principal accretion from CPI until maturity on 7/15/2019. I was then receiving less than $60 annually from that TIP with a 1.875% coupon purchased at auction. Needless to say, the pricing of that TIP at a -.89% current yield made no sense to me at all. Future Buys/Sells: Given my views about the future course of interest rates, I am not likely to buy more and will flip this 300 share purchase for a relatively small gain. While it would probably make more sense to buy WIW in the ROTH IRA, I bought the shares in a taxable account. I simply did not want to devote the available ROTH IRA cash to such a low yielding security. This post is long enough. To date, I have not received any disagreement about similar statements made in prior posts. I will discuss three other trades made last week in the next post. The exchange traded bond and preferred stock table has not been updated since June 2012. I had some free time this evening so I decided to update it. Before I started to lose bonds to redemptions, along with some profit taking, this table reflected a dollar value near $150,000 (e.g. 4/19/11 Post) and was a lucrative area for me during 2008-2012. It is now at $64,064.13 and will decline at least $9,000 next year without any action on my part. I am anticipating that the ten year treasury, which was yielding 1.66% on 5/2/13, will go over 4% within 18 months. A 4% to 4.25% ten year treasury yield would be normal when the market is forecasting a 2%-2.25% average inflation rate over that ten year period. The FED's bond buying spree, which hopefully is nearing an end, has driven the entire bond complex to abnormally low interest rates that would not exist in a bond market uninfluenced by the massive FED bond buying implemented pursuant to its various QE programs. Consequently, I have been mostly allowing this portfolio to run off, but I have started to nibble at a few securities over the past month or so. Next year, all of my principal protected notes issued by Citigroup Funding will mature at their respective $10 par values. Those securities account for $9,000 in principal amount and will need to be replaced with whatever bonds appear worthwhile at their respective maturity dates. Those Citigroup Funding notes have the following symbols: MOU, MTY (2), MOL (2), MKZ, MKN, and MBC (2). Of those MOU and MKN have had the biggest paydays, as mentioned in a post published earlier this year. Status of Citigroup Funding PPNs: MOU, MBC, MKN, MKZ All of those notes, except for MOL, are in their final annual coupon periods. While I would not buy MOU now, it has potential for another good payday in its last annual period. If the Russell 2000 closes one day above the MLV number on or before the End Date, the coupon reverts to 3%. If there is no MLV during the current annual period, and the Russell 2000 gains more than 3% over the Starting Value of 916.15 or 943.63 as of the End Date of 3/3/14, then the owner will be paid the percentage increase in the Russell 2000 over the Starting Value, which could be almost 37%. For example a RUT close at 1100 on 3/3/14 would result in a 20% coupon. (1100-916.15=183.85 divided by 916.15=20%.) A close at 930 or 900 would produce the minimum 3% coupon, as would one close above 1,255.12 between now and the End Date. The Russell 2000 closed today at 1,013.49, down 2.41% or 24.98 points. MOU closed at $10.51, down $.19, on the usual light volume. Limit orders have to be used for these securities given the anemic trading volume and unusually large bid/ask spreads. I am not in the market to buy more or to sell what I already own, and will simply allow all of them to mature. The MTY and MOL coupons are tied to the price of gold. MTY is in its final coupon period while MOL has two coupon payments left at a minimum of 2%. In its current annual period, the starting value on 11/19/12 was $1,730.50 per ounce of gold, London P.M. fix. I am not expecting more than the 2% annual coupon for the current period. Gold would have to rise to more than $1,765.11 by the 11/20/13 End Date to trigger any increase in the minimum 2% coupon. Prospectus There is always hope for the last annual period which ends on 11/19/2014. 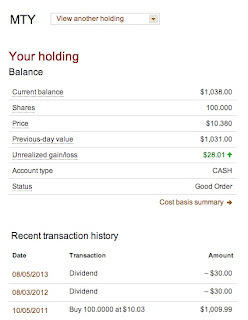 Please note that the broker incorrectly labels the distribution as a dividend. It is an interest payment. Those bonds were bought in the ROTH IRA, where I in effect convert a taxable bond into a tax free one. All of my trust preferred securities are now gone. I am down to just five fixed coupon trust certificates: JZJ, JZV, KTN (no call warrant attached), IPB (a collection of bonds) and PJA. I discuss equity preferred stocks primarily in two Gateway Posts. The Aegon and ING hybrids are in fact junior bonds but are treated as equity capital for regulatory purposes. For U.S. taxpayers, their distributions are not treated as interest but as qualified dividends. I have bought and sold those hybrids several times. For over a year, I did not own any of them, but I did recently buy AEB after the shares declined by over 20% due to the recent interest rate rise: Bought 50 AEB at $20 That one is a floating rate "bond" that pays qualified dividends at the greater of 4% or .875% over the 3 month LIBOR on a $25 par value. One benefit flowing sometimes from these securities is shown by their performance today. While I did have a number of securities go up in value today, as the S & P 500 declined 1.56%, the total loss in this portfolio was $2.71. Updated: After publication of this post earlier today, Paulo Santos published another article about CIDM at Seeking Alpha involving the CIDM theatrical release of "Short Term 12". I left a comment to that article, pointing out the favorable review from the NYT. I decided to increase my stake based on a well researched article written by Paulo Santos and published by Seeking Alpha. He goes into far more depth about this company than anything that I would normally say about a LT purchase. After this last purchase, CIDM released its fiscal year first quarter results for the Q/E 6/2013. The company reported a loss of 15 cents per share on revenues of $19.6M. Cinedigm Announces First Quarter Fiscal 2014 Financial Results During the quarter, CIDM incurred $2.6M of "direct theatrical acquisition, marketing and releasing costs" for 10 movies released theatrically. The "significant revenues generated by those releases" will be recorded during the second fiscal quarter. The company paid down $8.6M of nonrecourse debt during the quarter. B. 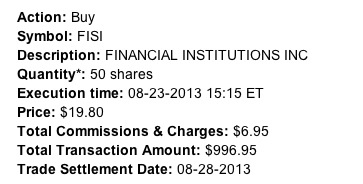 Sold 100 TST at $2.27 (see Disclaimer): TST is the symbol for TheStreet Inc. The dividend yield has been over 4% at my total cost per share number. This sell was motivated primarily by profit taking. I am not pleased, as a shareholder, when I read a story like the one referenced below either. Fiat SpA (FIATY.PK) Key Developments Page at Reuters. 4. Allied Motion Technologies (AMOT): I noticed last Thursday unusual action in AMOT. Normally, volume is around 10,000 shares. Volume spiked to 116,069 on 8/22, and the shares rose almost 11% in value. I guess investors like this deal. Globe reported revenues of approximately $106M in 2012. AMOT claims that the acquisition will be accretive. When completed this acquisition will more than double AMOT's revenues. I was allowed to go over the $300 limit due to prior profits in this stock. Forest City is developing a huge project in NYC called Atlantic Yards. That project included as its first phase the construction of the Barclays Center in Brooklyn. Forest City purchased the NBA team, formerly known as the New Jersey Nets, and moved that team to Brooklyn, rechristening the team as the Brooklyn Nets. Beginning in 2015, the Barclays Center will be the home of the New York Islanders. Forest City then sold 80% of the Brooklyn Nets and 45% of the area to the Russian billionaire Mikhail D. Prokhorov. All of the foregoing was a lever for the development of high rise apartment buildings in this area. In the Atlantic Yard project, there are 14 more apartment buildings that are planned near Atlantic and Flatbush Avenues, with close to 6,000 apartments, and one office building which could include a hotel. The NYT reported last week that Forest City was seeking a partner for that development and is willing to sell anywhere from a 50% to 80% stake while retaining management authority. The NYT reported that this transaction could generate as much as $800M. 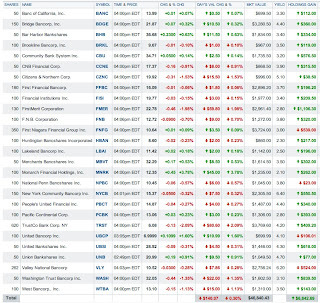 Last Thursday, when the Nasdaq had its latest mishap, a number of my regional bank stocks traded on the Nasdaq showed suspiciously large gains. The basket was up close to $600 that day due largely to those gains. The market took away some of those unusual gains last Friday. Even after the stocks started to trade again, I noticed strange quotes, like a bid price significantly over an ask price. Since my last update, I have made two small purchases, Added 50 BDGE at $20.76/Bought 100 NPBC at $10.68, and one disposition, Sold 151+ WBCO at $15 (profit $217.23). I was disappointed in WBCO's last earnings report. I will consider buying back no more than 50 shares at below $13.5 (Previous Buys: Bought 100 WBCO at $13.46; Added 50 WBCO at $13.3). Last week, Stifel Nicolaus upgraded TRST, UBSI, and PBCT to buy from hold. B. Community Bank System (CBU): Community Bank System increase its dividend for the 21st consecutive year. The new quarterly rate will be $.28 per share, up 3.7% from the prior level. The dividend history since 1986 can be found at the bank's website. Compared to a KO, the dividend growth rate is slow. The quarterly dividend was raised from $.145 to $.16 in the third quarter of 2003. So that is not even a double in ten years. Still, the dividend was raised during the Near Depression period and that makes CBU noteworthy in addition to the 21 consecutive years of dividend increases. Perhaps, I needed to buy more shares when making this purchase: Bought 50 CBU @ 23.18 (October 2010). 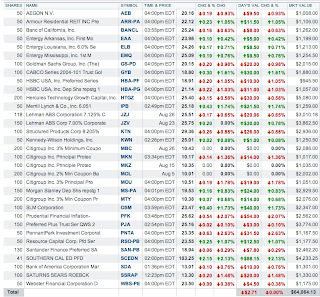 C. ADDED 50 Financial Institutions (FISI) at $19.8 (see Disclaimer): This was an average up. I bought the shares in a satellite brokerage account where I have sold some banks earlier this year, with the largest being my position in RNST. Financial Institutions increased its quarterly dividend to $.19 per share, up 6% from the prior dividend and 36% from the dividend declared in the 2012 third quarter. This bank, based in NY, did participate in TARP. The bank redeemed the remainder of the government's preferred stock after selling common shares. SEC Filed News Release In March 2011, the bank sold 2,813,475 shares at $16.35 per share, page 16 10-Q.